Commentary: When it comes to online comments and discourse and what you can do to limit their toxicity, you only have a certain amount of power. The real leverage lies with the tech companies. This column is going to be a bit unusual. Typically, I write about a broad tech problem and offer some solutions. But this week, I have stumbled into a topic that many agree has no easy fix: online comments. Over the last decade, commenting has expanded beyond a box under web articles and videos and into social networking sites like Facebook and Twitter. That has opened the door to more aggressive bullying, harassment and the ability to spread misinformation — often with difficult real-life consequences. What does that show us? That you as an internet user have little power over content you find offensive or harmful online. It is the tech companies that hold the cards. Given the way things are going, our faith in the internet may erode until we distrust it as much as we do TV news, said Zizi Papacharissi, a professor of communication at the University of Illinois-Chicago who teaches social media courses. “I think we are the ones who are breaking it, because we never completely learned how to use it,” she said of the internet. “We break it and we fix it again every day. At some point it will crack,” added Papacharissi, who also edited A Networked Self, a series of books studying people’s behaviors and relationships on social networks. Why are internet comments so hopelessly bad, and how do we protect ourselves? Even though there is no simple fix, there are some measures we can aim to take. Here is what you need to know about how we got here and what you can try. — Why are people so toxic online? There are many theories about why the internet seems to bring out the worst in people. I gathered a sampling of some noteworthy findings. Papacharissi said that in her 20 years of researching and interviewing people about online behavior, one conclusion has remained consistent: people use the internet to get more of what they do not get enough of in everyday life. So while people have been socialized to resist being impulsive in the real world, on the internet they cave to their temptations to lash out. “The internet becomes an easy outlet for us to shout something and feel for a moment fulfilled even though we’re really just shouting out into the air,” she said. This is nothing new, of course. Before the internet, people took their frustrations to TV and radio talk shows. The internet was simply a more accessible, less moderated space. Daniel Ha, a founder of Disqus, a popular internet comment tool used by many websites, said the quality of comments vary widely depending on the pieces of content being discussed and the audiences they attract. For example, there are videos about niche topics, like home improvement, that invite constructive commentary from enthusiasts. But there are others, such as a music video from a popular artist or a general news article, which ask people from all around the world to comment. That is when things can get especially unruly. “You have an airport of people from all walks of life coming together, and they’re speaking different languages with different attitudes and they’re just saying stuff,” Ha said. Comments can be terrible simply because many people are flawed. It is up to the content providers and tech platforms to vet their communities and set rules and standards for civilized discussion. That is an area where many resource-strained news publications fall short: They often leave their comments sections unmoderated, so they become cesspools of toxic behavior. It is also an area where tech companies like Facebook and Twitter struggle, because they have long portrayed themselves as neutral platforms that do not that do not wish to take on the editorial roles of traditional publishers. — What about fake comments? Tech companies have long employed various methods to detect fake comments from bots and spammers. So-called Captcha tests, for Completely Automated Procedures for Telling Computers and Humans Apart, ask you to type a word or select photos of a specific item to verify you are human and not a bot. Other methods, like detecting a device type or location of a commenter, can be used to pin down bots. The FCC said in a letter that it planned to re-engineer its comment system in light of the fakes. Other than that, do not take web comments at face value. Kao said the lesson he learned was to always try to view comments in a wider context. Look at a commenter’s history of past posts, or fact-check any dubious claims or endorsements elsewhere on the web, he said. In the case of Infowars, Apple, Google and Facebook were the ones that banned some content from the conspiracy site after determining it violated their policies. Twitter’s chief executive, Jack Dorsey, said Tuesday that the company did not suspend the accounts belonging to Infowars because its owner, Alex Jones, did not violate any rules. “If we succumb and simply react to outside pressure, rather than straightforward principles we enforce (and evolve) impartially regardless of political viewpoints, we become a service that’s constructed by our personal views that can swing in any direction,” he said in a tweet. Twitter did not immediately respond to a request for comment elaborating on the decision. 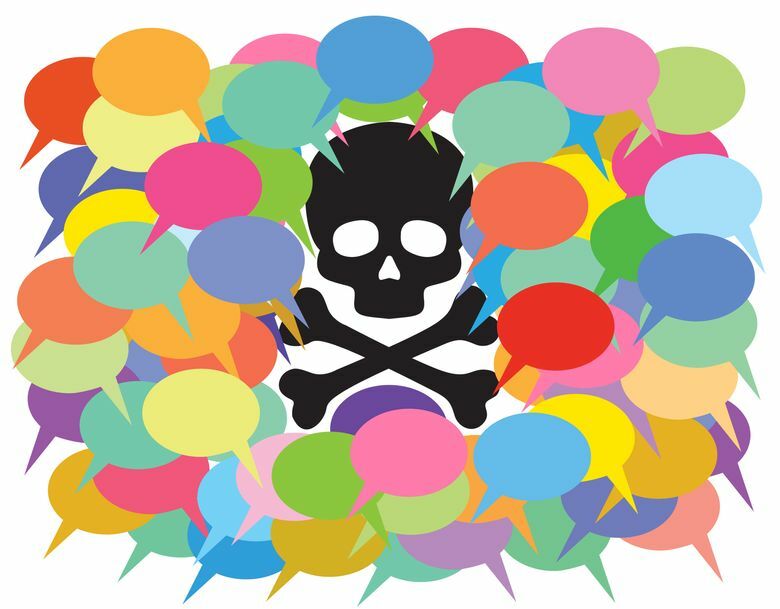 When publishers and tech companies fail to address inappropriate comments, Papacharissi recommended an exercise in self-discipline.